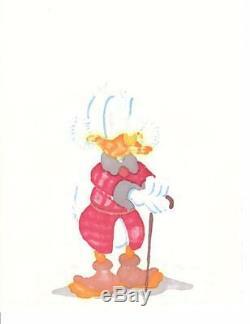 This original art drawing titled Grumpy Scrooge With Walking Stick! Was HAND DRAWN & HAND SIGNED by one of Disney's legendary artists and cartoonists, Don Rosa! The condition of this drawing = Near Mint (9.0 To 10.0/10.0). The image area is flawless, clear, & bright. There is very slight wear on the outer edges of the drawing. The dimensions of this original art drawing = 8.25" width x 10.75" height 20.6 cm. With an image area = 7.5" width x 7.75" height 18.7 cm. In addition, the length of Don Rosa's signature = 2.25 5.6 cm. Grumpy Scrooge With Walking Stick! Original Art Drawing Hand Drawn & Hand Signed By Don Rosa! GRUMPY SCROOGE WITH WALKING STICK! Hand Drawn & Hand Signed Original Art Drawing. (1) Grumpy Scrooge With Walking Stick! Riginal Art Hand Drawn & Hand Signed By Don Rosa. Condition = Near Mint (9.0 to 10.0/10.0). 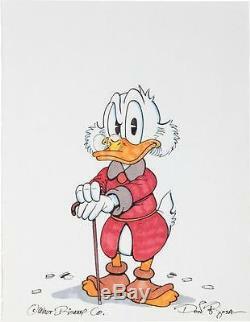 This commissioned original art drawing shows a grumpy Uncle Scrooge with his cane or walking stick! Why do you think Scrooge is so grumpy? 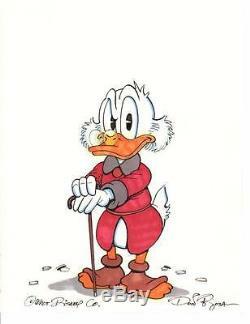 One answer may be that Scrooge has to pose for this drawing!! Characters and images in this drawing have been hand drawn and hand colored by Don Rosa! With high grade colored markers on standard white-colored drawing paper. Don Rosa in black ink near the bottom right hand corner of the drawing. Of the drawing = 8.25" width x 10.75" height 20.6 cm. Image area of the drawing = 7.50" width x 7.75" height 18.7 cm. The length of Don Rosa's signature = 2.25 5.6 cm. This also applies to our international buyers!!! We will respond to all emails within 24 hours. Create listings that get noticed! With Auctiva's 1,800+ Templates. The item "Disney Don Rosa Art Original Signed Drawing Grumpy Scrooge McDuck With Cane MINT" is in sale since Thursday, February 09, 2017. This item is in the category "Collectibles\Comics\Original Comic Art\Drawings, Sketches". The seller is "qkick247" and is located in Ohio. This item can be shipped worldwide.